Steve The Cook, providing catering services for Lowell, Dracut and Chelmsford Massachusetts. Corporate luncheons, dinner buffet parties, catered breakfast ~ brunches. 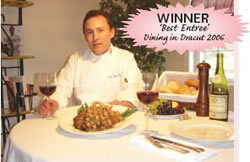 Steve the Cook Catering Services is an all-occasion catering company serving the Greater Lowell area. We commonly work in many Massachusetts cities and towns - Dracut, Lowell, Chelmsford, Westford, Andover, and Tewksbury to name a few; as well as Nashua, Pelham, Hudson and other New Hampshire cities and towns. Our professional staff provides excellent meal and full function planning services; from hall, tent, and table rentals, through china, linens and other harder-to find-party items. Let us help make your event special. Our variety of menus are perfect for your next family celebration; whether it be a wedding, bridal shower or baby shower, birthday party or anniversary party, barbecue, or other family get-together. 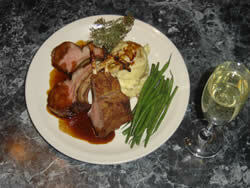 Our Culinary Institute of America trained Chef makes so many more excellent items than we can list on our menus. So please call or email us - we work with all size functions and budgets! You can opt for a fully catered event with our trained waiters, waitresses, and bartenders; or elect for our free drop-off and pick-up service. Whatever your needs, our professional catering service can provide it. Attention corporations! Our meeting breakfast and luncheon services are second to none! Our food is always fresh, hot, delicious AND on-time. Delivered and set up by our discreet servers, your meal arrival won’t distract your team from their main purpose. After the meal, we provide the breakdown and clean up services that let you get right back to work without missing a beat.